The draft Mueller document adds materially to the existing record of Trump campaign support for and coordination with the Russian-WikiLeaks scheme. The special counsel’s draft Statement of Offense for Jerome Corsi includes much extraordinary information. But what are the most legally significant details to emerge? At bottom, the draft court document supplies additional reason to believe that Bob Mueller can charge Trump Campaign associates and the campaign itself for violations of federal campaign finance law either directly under the Federal Election Campaign Act (FECA) or as part of a conspiracy to defraud the United States by obstructing the capacity of the Federal Election Commission to enforce the FECA. 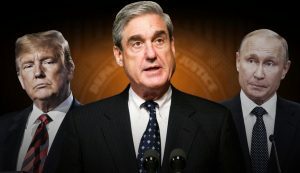 The federal offense of a conspiracy to defraud the United States serves as the backbone of the special counsel’s February 2018 indictment of Russian nationals, which then raised the question whether the special counsel would subsequently indict any Americans for knowingly participating in the general conspiracy. The activities of Roger Stone, Jerome Corsi, and Ted Malloch, as shown by what Mueller decided to include in the draft document, points to legal jeopardy for them and any others who knowingly participated with them in this scheme with Wikileaks. As one of us (Bauer) has written, the February indictment of Russian organizations and individuals revealed the Kremlin to be operating, along with Wikileaks, as a veritable Super PAC in support for then-candidate Trump. The Trump campaign could not lawfully coordinate its political communications with Wikileaks without running afoul of federal campaign finance laws. As a foreign national, WikiLeaks may not provide anything of value to an America political campaign, and Americans could not knowingly and substantially assist Wikileaks’ illegal electioneering activity. The prohibition extends to solicitations of this campaign support by any agents of the Trump campaign. Moreover, the campaign finance law applies to Wikileaks’ activities in two ways: as an entity pursuing its own anti-Clinton political objectives, and as an agent of a foreign government, Russia, with which it was collaborating toward this end. In other words, Mueller is working with an expansive legal framework that Congress designed to prevent foreign national influence in our elections and that legislators repeatedly amended over the years to root out loopholes and end-runs. The draft statement of offense contains facts that that would significantly strengthen the prosecution’s hand in building and bringing such a case. It is worth emphasizing several pieces of information in light of this legal framework. First, Mueller appears to believe Stone was acting in direct communication on campaign related matters on behalf of the Trump Campaign, serving as a strategic adviser well past the time his formal position ended in 2015. He spoke regularly with Donald Trump and sent the candidate memos on campaign strategy. 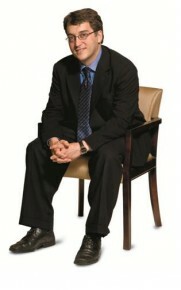 Others such as Corsi knew of Stone’s role. The draft Statement of Offense says that Corsi “understood [Stone] to be in regular contact with senior members of the Trump Campaign, including with then-candidate Donald J. Trump” when Stone “asked Corsi to get in touch with [Wikileaks] about materials it possessed relevant to the presidential campaign.” This dovetails with the special counsel’s July 2018 indictment of Russian military intelligence officers, which also conspicuously states that Stone was “in regular contact with senior members of the presidential campaign of Donald J. Trump” when he communicated privately with the Russian intelligence front Guccifer 2.0 in August of 2016. Second, Stone’s written instructions to Corsi constituted an explicit solicitation of support: “Get to (Assange) [a]t Ecuadorian Embassy in London and get the pending (WikiLeaks) emails” (our emphasis added). The intent to solicit, in effect, could not be clearer. 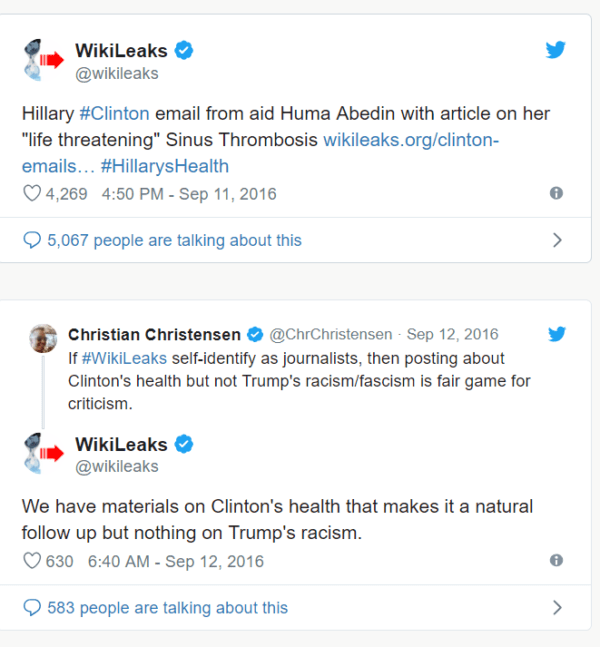 By the end of August, other news outlets observed the same pattern: “Trump surrogates—people chosen by the campaign to speak on his behalf—have told voters that Mrs Clinton suffered a stroke and has seizures.” A stroke – exactly what Corsi’s email to Stone on Aug. 2 suggested they emphasize in coordination with a coming Wikileaks’ release. As an aside, we should note that the Kremlin’s influence campaign also considered Clinton’s health a focal point, according to the U.S. Intelligence Community’s January 2017 report. The report highlights the same month of August: “In August, Kremlin-linked political analysts suggested avenging negative Western reports on Putin by airing segments devoted to Secretary Clinton’s alleged health problems.” Rep. Jackie Speier also noted the timing of Trump’s statements and the Trump campaign’s advertisements concerning Clinton’s health in conjunction with the Kremlin’s social media campaign adopting the same theme in the same time frame. “What I’d like to understand is who was mimicking who?,” Rep. Speier asked social media companies. But what about Wikileaks’ promised document dump related to Clinton’s health? If that never materialized, it could indicate that Corsi’s information was bunk. Wikileaks made good on its promise, however. In September, Wikileaks highlighted one of the Clinton State Department emails housed in its document database, raising the idea that she had blood clot issues affecting her brain. 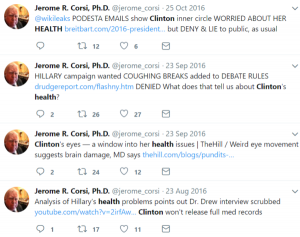 But what about the strange reference in Corsi’s email to Stone referring to Wikileaks information on Clinton’s health as though it were connected to documents related to Podesta? That materialized as well. On October 24, Wikileaks released documents from the trove of stolen Podesta emails suggesting that Podesta and other members of the campaign were concerned about Clinton’s health. 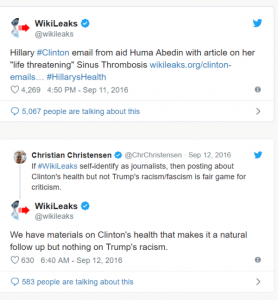 The Trump circle quickly helped promote the Wikileaks documents. 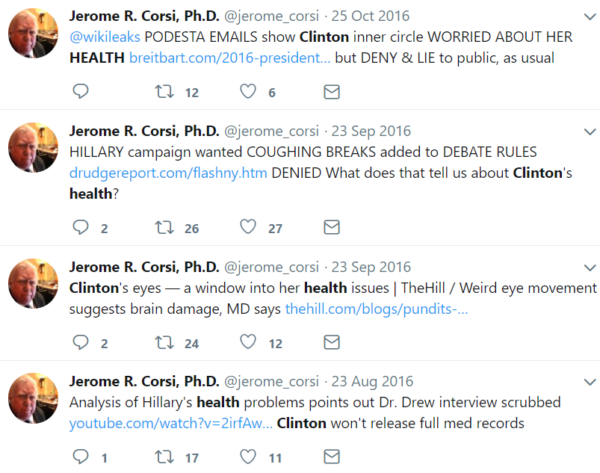 Corsi’s own Twitter account tracks the chronology from laying the groundwork in August to capitalizing on the Wikileaks Podesta release in October 2016. It is also important to note that throughout this period, Trump, Stone and Corsi knew that they were seeking campaign support from foreign nationals. WikiLeaks status as such was well known. By July of 2016, moreover, it was widely reported that the U.S. Government had identified the Russian government as the responsible party in the hacking of the Democratic National Committee. In that same month, Donald Trump acknowledged the Russians’ involvement, publicly calling on them to find “missing” Clinton emails. So when Corsi refers in one of the newly revealed emails to the “hackers” who are supplying WikiLeaks, he would have understood, or had good reason to know, the identity of these hackers: the Putin regime. In sum, the draft Mueller document adds materially to the existing record of Trump campaign support for and coordination with the Russian-WikiLeaks scheme to influence the outcome of 2016 presidential election through a program of political sabotage. There is no reason to doubt that more from the Mueller probe is yet to come. What is known already leaves little standing of Donald Trump’s repeated denial of “collusion.” There was collusion, and it occurred in violation of federal law. 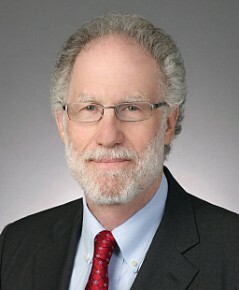 Originally published by the Just Security, New York University School of Law, under the terms of a Creative Commons Attribution-No Derivs-NonCommercial license.